Here is some nail art I wore last week. I found some images of dragon stuff online, then edited them in Photoshop to get the designs and colours I wanted. I then printed them onto the temporary tattoo paper that I featured in the tutorial here. The index finger represents the dragon skin/scales, the index finger is clearly his eye. Thank you to Mr Kitties26 for his suggestion to make the dragons eye green, it looked so amazing!! 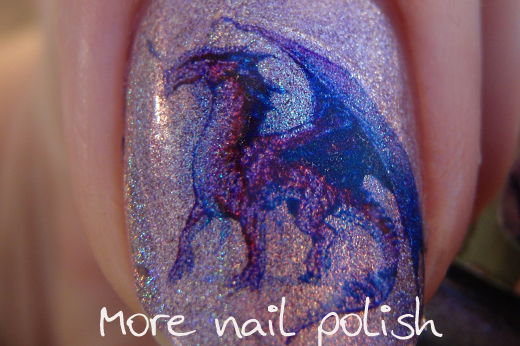 The ring finger is the fire that the dragon breaths, and the pinky is an abstract part of the dragons wing. 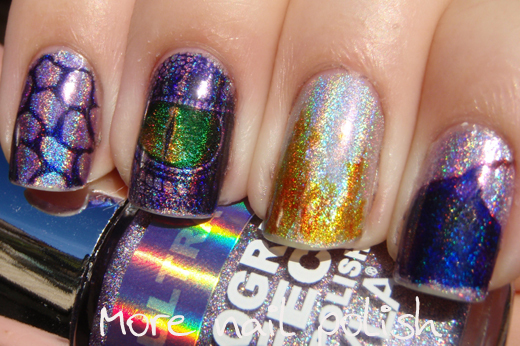 The ring finger is painted with Layla Mercury Twilight, and the other fingers are painted with Layla Ultra Violet. Apologies for the tip wear, these were taken at the end of day two. I suddenly had a gap in the clouds and snapped some sun shots, rather than the photos under the bathroom light. I love this up close of the dragon eye. 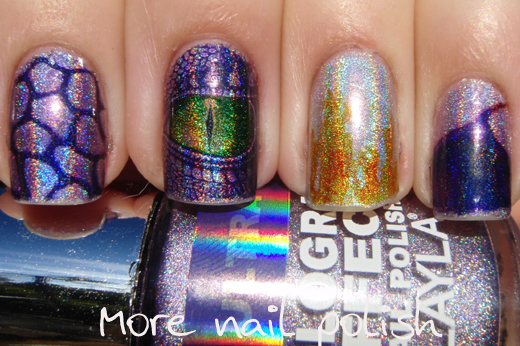 The gradient of the yellow and green, with the holo behind it was so cool. Finally, here is the image used on my thumb. I had to take a photo in the shade, because the sun photo was just too holo to be able to see the actual image on my nail. Sorry about the lack of chit chat ladies, I'm so unbelievably busy at work at the moment, I just can't empty my brain of work stuff to insert nail stuff into it. Damn stupid brain - work faster or something. I wish I could just backup my brain to an external hard drive, and then reload it ready for work the next morning! That is fabulicious! It's like you've tattooed your nails. The eye is brilliant, you are a very talented lady, thanks for sharing. LOL at your external hard drive brain! That is seriously really cool!! This is the seller I purchased from, although they only ship to Australia. I'm sure there must be one somewhere that ships internationally. Just sear "temporary tattoo paper". I love dragons, and this is simply amazing! I'm especially loving that dragon's eye! WOW! Oh this turned out great! 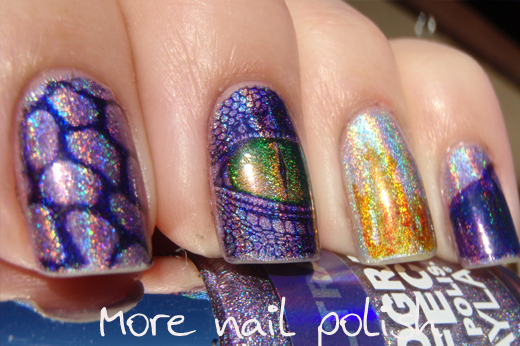 Love the eye, I'd probably them on 2 nails, it would look awesome. 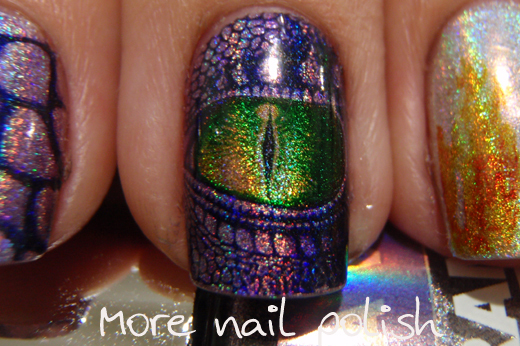 Ilove it!.My favorite one was the dragon's eye! Seriously gorgeous! Thank you for sharing this. That eye is simply incredible! That eye steals the show! This look is AMAZING. Just love it!! Yes, you can definitely use a regular temporary tattoo, in fact that is exactly where I started. This is probably the best nail art I have ever seen. Holy wow! This is totally amazing! 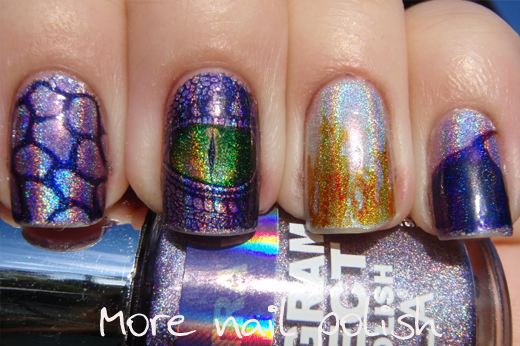 Absolutely the best nails I have seen on the web! Here via Pintrest and love the idea of tattooing your nails. I am sure you know that a coat of clear polish on top will extend the wear of you polish past two days, but did you know that if you put your top coat on the underside of your nails as well (yes, against your fingertip)it helps it last that much longer? I did all the nail stuff in the '80's (yeah, I'm old) and am so impressed by how far nail art has come since then. The eye is my favourite! Now to find a source that ships to Canada.